Rakesh Jhunjhunwala is recognized as stock guru and warren buffet of Indian stock market. 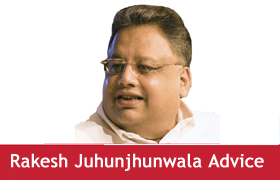 Rakesh Jhunjhunwala is true wealth creator. He generated wealth of 6000 Crore from small capital of 5000 Rs/-.Rakesh Jhunjhunwala is down to earth person. He is always ready to help investor by giving them valuable advice. I am herewith valuable advice given by Rakesh Jhunjhunwala to stock market Investors. It is actually extract of chat done by Rakesh Jhunjhunwala with Kalpraj Dharmashi of ValueQuest. First advice given by Rakesh Jhunjhunwala is to invest in stock market like gold or real estate. When we invest in gold or in real estate, we never think about return as we know that it will defiantly give good return in days to come. We quietly sit on this investments, but when it comes to stock market investment we react in different manner. We challenge our own investment decision. Although we have taken informed decision to buy fundamentally strong stock, we start checking performance of stock from date of purchase. Downward movement of this stock make us anxious. We start thinking that whether we have done mistake in selecting this stock. Rakesh Jhunjhunwala advice that invest in stock if you are absolutely convinced about it. Once you invest in stock don’t get prejudice with temporary events. Stay with stock for long-term. Long term investment always pays. -Uber, the world’s largest taxi company owns no vehicles. -Facebook the world’s most popular media creates no content. -Alibaba, the most valuable retailer has no inventory. -Airbnb the world’s largest accommodation provider owns no real estate. -Whatsapp with 3 Billion messages a day does not own servers. Disruptive, innovative and collaborative consumption is shifting the lines of the economy. Create valuable assets and not always physical assets. Second advice given by him is don’t expect unrealistic return from stock market. He shared one incident that once upon a time one pretty girl ask him about good stock and price target. Rakesh Jhunjhunwala gave detail about stock. Next question asked by girl was how much return is expected out of it. Rakesh Jhunjhunwala said that it will double in next three years (26% CAGR). Girl was not happy with 26% return. Rakesh Jhunjhunwala explained that we should set realistic target while purchasing stock. If in other assets class returns go up to 10% in equity it can go up to 18-20%. He further explained that if he is able to make 18% return on portfolio, he feel like king and if he makes 24% return, he feel like emperor. Rakesh Jhunjhunwala said that trading and investing are totally different. You should not mix both of this. Remember trader always look for short-term return and buy stock with short-term prospective. Trader often look for quick fire gains. Investor always look for long-term and buy stock accordingly. As per Rakesh Jhunjnunwala you should wear cap of Investor while buying stocks. Question asked by you is very good, however i don’t have any details how Rakesh Jhunjhunwala is managing his share.Direct Holding option is given only to some specific trade house by SEBI.